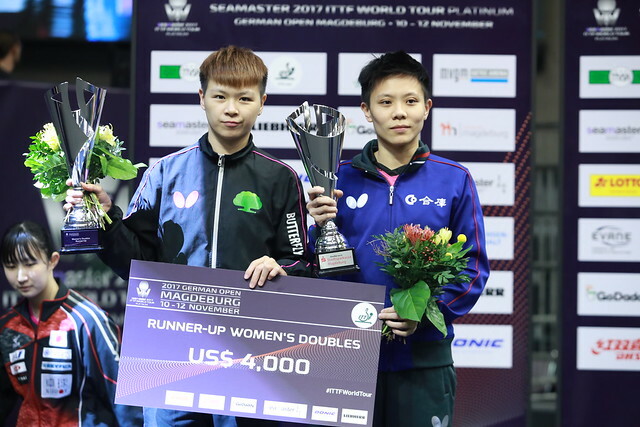 The initial stage of qualifying action drew to a close on Wednesday 8th November as unseeded players involved in the qualification tournament met in the remaining group stage matches, attempting to boost their chances of reaching the Seamaster 2017 ITTF World Tour Platinum German Open in Magdeburg. Players competing in groups 3 to 30 in the Women’s Singles group stage battled it out for top spot in the groups with places in the preliminary qualification round on offer and one competitor who successfully achieved that goal was Japanese representative Mizuki Morizono. Despite entering her final Group 18 encounter 33 positions below her opponent, Mizuki Morizono proved too strong for Singapore’s Yu Mengyu (11-4, 11-2, 11-7, 11-8) and will meet Wang Yidi of China for a spot in the main draw. Tie Yana has had her Women’s Singles qualifying campaign cut short after the Hong Kong contestant suffered a surprise group stage elimination at the hands of Cheng Hsien-Tzu. Leading the Group 17 finale by three games to two Tie Yana found herself just one game win away from top spot, but a superb response from Cheng Hsien-Tzu saw the Chinese Taipei contestant recover to extend her qualification journey (11-6, 11-6, 5-11, 5-11, 11-9, 9-11, 4-11). Bernadette Szocs was the highest ranked player participating in Group 30 but the Romanian will play no further part in the competition after she finished behind China’s Liu Xi, while the winners of groups 1 and 2, Doo Hoi Kem and Miyu Nagasaki, move directly through to main draw. There was a dramatic turn of events in Group 46 of the Men’s Singles qualification group stage as German player Steffen Mengel lost out to Hunor Szocs across seven games. Holding a commanding lead by the conclusion of game four the host nation’s Steffen Mengel looked to be well on course to achieve victory against the Romanian and seal first position in the group. However, Hunor Szocs picked up three game wins in a row to steal top spot (9-11, 13-11, 13-11, 11-8, 9-11, 7-11, 1-11) and subsequently advance through to the 1st preliminary round. Nigeria’s Quadri Aruna has failed to progress from the group stage of the qualification tournament after finishing in the runner up position in Group 12. Bence Majoros was the player who emerged as group winner following the Hungarian’s six games victory over Quadri Aruna (6-11, 11-5, 13-11, 3-11, 11-2, 11-8) and there was an upset from India’s Sathiyan Gnanasekaran, who edged out Romania’s Ovidiu Ionescu by the narrowest of margins in the deciding game (13-11, 8-11, 11-8, 3-11, 3-11, 11-8, 14-12).